Happy (2 days after) 4th of July! I LOVE celebrating this holiday in Miami. Between the beach, the festivities at the community center and the numerous firework shows you get to enjoy from the beach, there is no where better to be. Being on the beach for twelve hours takes a lot of sun tan lotion and serious food and drink planning. And since we have the advantage of living on the beach, we can plan really good food and drink. We of course had the beach staples – sandwiches for lunch, and fruit and chips for snacking on throughout the day. We got fancy for dinner. I made chicken wings in the crockpot, a white bean and avocado salad and two types of brownies. I had everything already packaged up and a second picnic basket ready to go, so when we were ready we just ran up to the condo, quickly put the chicken in the broiler to crisp up while we grabbed everything else (and took a bathroom break. MASSIVE benefit of living on the beach is access to own bathroom). We were back down on the beach in twenty minutes with a hot dinner. Win! There is nothing better after 7 hours in the water and the sun then a real meal. We devoured it. The chicken* was so tender it fell right off the bones. And they were so flavorful! A nice heat but not overwhelming, which is good because I was done sweating for the day. The brownies were to die for, especially the one I’m calling Extreme Oreo. I really wish I hadn’t brought it down to share, so I could still be eating it today. Luckily I forgot to take a picture of it, so I am going to be forced to make it again so I can properly share the recipe with you. 😉 Expect it (plus all recipes mentioned aside from the chicken) in upcoming week. Plus a recipe for the incredible drink we enjoyed – a White Sangria. So light and refreshing. I wish 4th of July was more than once a year. * I used a recipe I found on allrecipe.com for the chicken. I kept all the ingredients the same, but did omit one final step. Not because I was trying to be quick to get back to the beach, but because I didn’t realize there was a final step till just now when typing in the recipe. 🙂 Apparently before serving I was suppose to boil more Franks Hot Sauce and butter, to create a sauce to coat wings with. If you like your wings really wet, broil them for longer then the 10 minutes I did so they get crispier, or if you want it hotter then we had it, you should probably not omit this step. But for us, the wings were perfect, and since I am lazy, I doubt I will ever do this step. Combine all ingredients except for chicken in a small sauce pan. Cook over low heat until begins to boil. Place chicken in the crockpot. Pour sauce over chicken. Cover and cook on low for 6-7 hours. Do not overcook, as you don’t want chicken to fall off bone prior to serving. 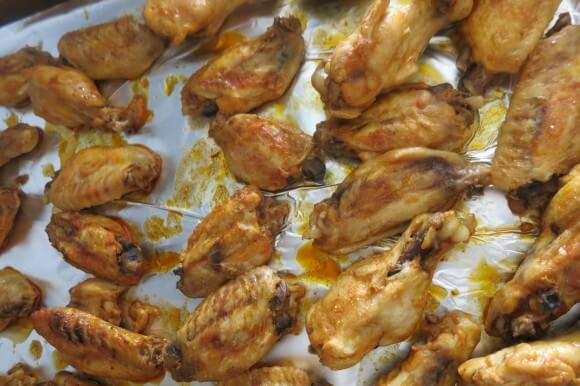 Remove chicken from crockpot, and place on a tin foil lined baking sheet. Broil at 500 degrees for 10 minutes, to put a little crisp into them. Enjoy with ranch or blue cheese dressing!